Some folks who finally leave their jobs for a life of leisure take up golf or tennis, or redecorate their homes. Some decide to get rid of their homes altogether, and downsize to an apartment or condo. That keeps people busy for months on end, and sometimes that’s all retired people want – to be kept busy. And still others commit to a lot of hours of volunteer work to keep their minds engaged. Not Ernie Andrus. 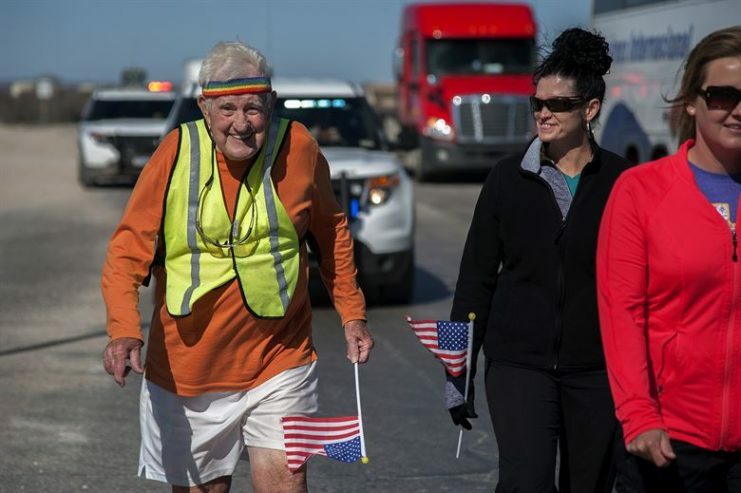 Mr. Andrus, a 93-year-old veteran of the Second World War, decided to go for a run. A long run – right across America – from Georgia to San Diego, to be exact. 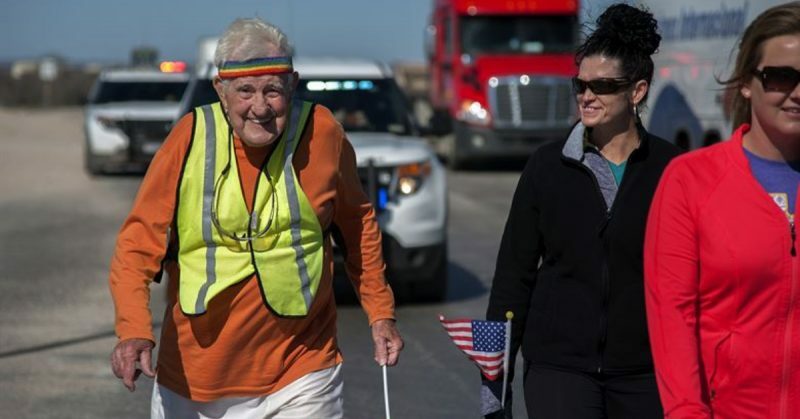 It is the same run he completed in 2016 when he was just 90 years old. During that run, he averaged about 18 miles per week. Andrus recently told CBS Morning News that, “I was running three days a week, but it’s the same old thing. And I just got bored,” he added, as if he had just spontaneously laced up his sneakers and gone for a 10-mile run, not a thousands-of-miles run that will take him years to complete. Andrus reckons he will trot into San Diego just in time to celebrate his 100th birthday. When Andrus did his cross-country run in 2016, he began the journey in San Diego, rather than ending there. Throngs of people met him when he arrived in Georgia, and he candidly says he is hoping to repeat that thrilling experience. It reminded him of the youthful exuberance he felt while landing on beaches as part of a Navy ship’s crew during World War II. 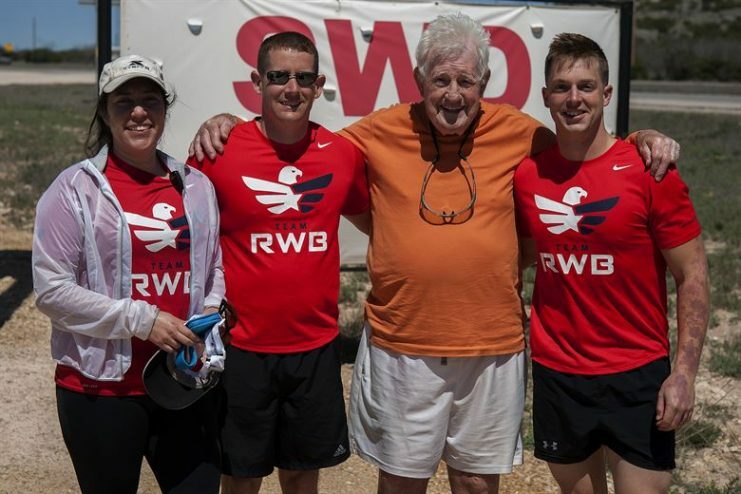 Andrus is running to raise awareness and funds for the LST 325 Ship Memorial, the precise kind he sailed on during the war. Andrus was a member of the crew that helped get the ship to America from Crete, Greece in the early 21st century. The ship is open for tours in Evansville, Indiana. His home page at www.Coast2Coastruns-Ernie-Andrus.com explains that Andrus hopes to be aboard the restored ship if it heads back to Normandy for a D-Day celebration. Andrus says he plans to run for five years, an average of 13 miles per week. 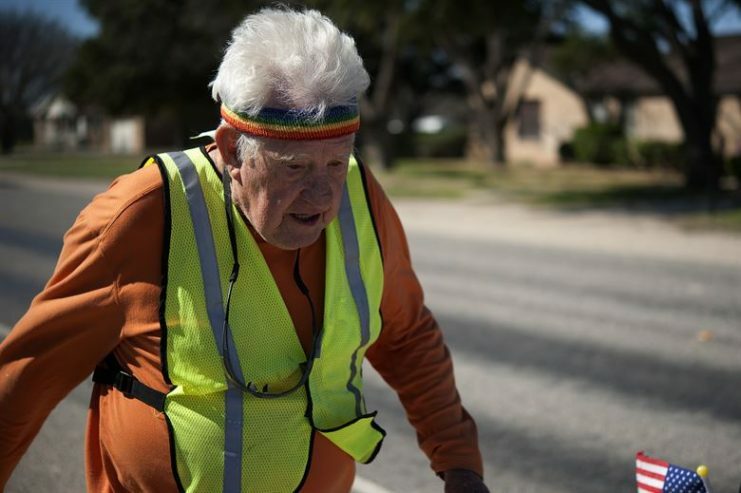 He says that if anything prevents him from completing this run, he will simply “go back and run it another time.” Apparently, Andrus hasn’t heard, or simply doesn’t believe or worry that most people don’t live to be 100 years old. His steely determination saw him through some difficult times during his 2016 run. 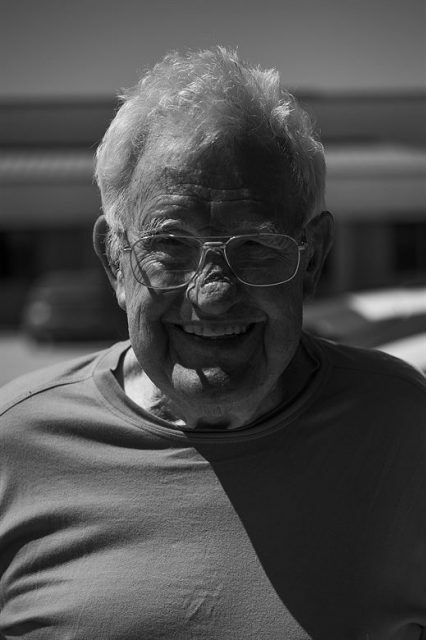 He took a one-week break at Christmas, but only took a three-week break when his wife passed away, choosing instead to get back on the road as a way of honoring her. The LST is a World War II era ship used to land equipment and troops on hostile shores. I was one of the crew that brought the ship back from the Isle of Crete to the U.S. in 2000/2001…. One thousand and fifty-one LSTs were built during World War II. The 325 is the only one that is restored and operational. My dream is to take the ship back to Normandy for a D-Day Memorial. I didn’t raise enough money on my first run, so I’m trying again. If stubborn resistance to odds is a key ingredient to success, Andrus has nothing to worry about. In all likelihood, he will make it to San Diego, California – if not this time, then when he tries yet again to fulfill his dream. Anyone wishing to donate to Andrus’s cause or monitor his progress should contact his website for details. Again, the website is: www.Coast2Coastruns-Ernie-Andrus.com.